Here is a sneak peak at the latest offering from Equiline. The “Dress Code” for Fall/Winter 2014/2015 is inspiring, making full use of the season’s colors. Add to that, the innovative use of fabrics and styling shows why Equiline is enjoying the top spot among all riding apparel brands. Equiline’s designs are clean and modern. There is also a move towards the “less is more” philosophy. So, let us get started. Equiline has always been the leading innovator. They have taken bold steps to further the riding clothing industry. You can see how these breeches have no seams around the patch. It is specially constructed from Silicone for better grip. Notice also the special fabric inserted in the breeches. 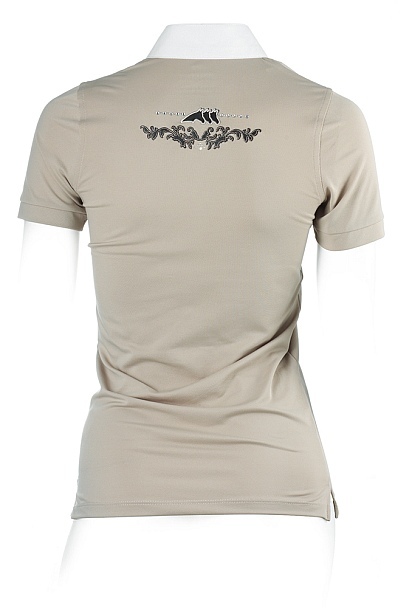 This stretch fabric allows full freedom of movement for the rider. It also adds a beautiful contrast tone to the riding pants. Quite innovative, we think. What do you think? This is a beautiful jacket with a focus on modern styling and fabrics. Notice how the buttons are not black colored. Also the 2 zipper pockets on the sides. The best part of the jacket is in the collar. The trims along the front collar are fantastic and add an element of elegance! 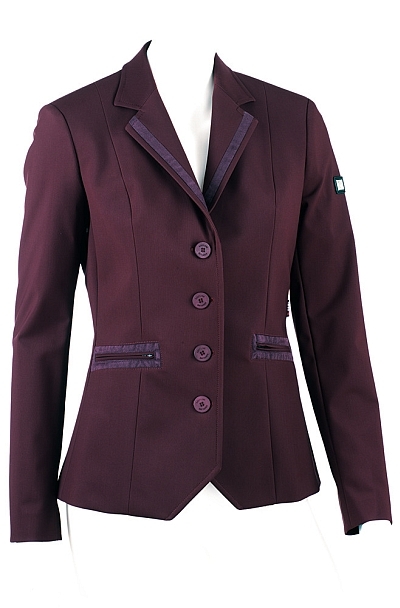 Here is a jacket that can be used for both dressage and show jumping. 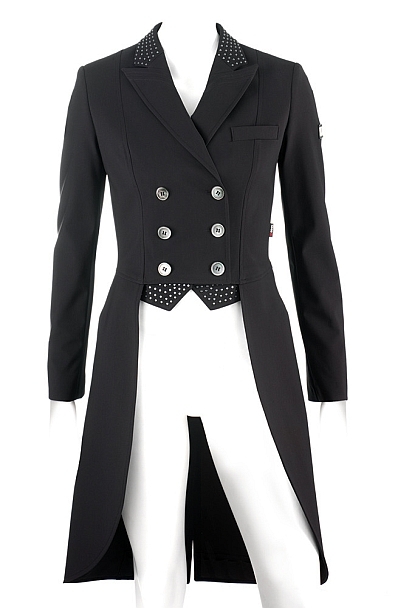 Gilda Competition Show Jacket – Front View in Black by Equiline. Also available in Gray color. Once again, its the small details that count the most. For instance, the “mother of pearls” buttons on this jacket are not only eye-catching, they elevate this jacket head over shoulders. The cut is traditional. This one can be used by either dressage riders or show jumpers. This shadbelly continues from where the Gilda Competition Jacket left off from. The “mother of pearls” buttons are adorned on both the collar and points of the shad. Clean design and very inspiring, do you agree? This gorgeous show shirt has laser embroidery on the front and back. The signature Equiline horses and Equiline logo are embroidered. The logo itself is surrounded by shiny crystals. This makes a very beautiful show shirt. Quite frankly speaking, this is the most stunning show shirt ever. What do you think? 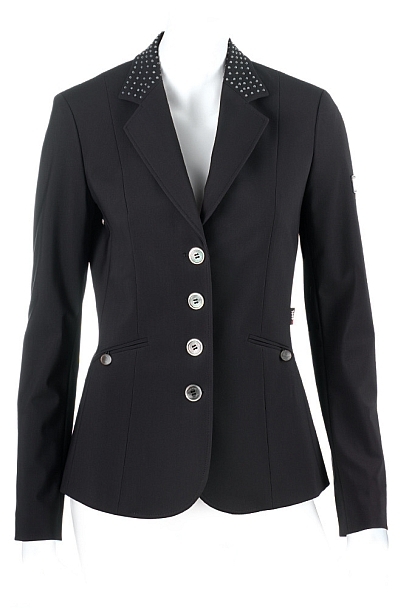 We love the new styles from Equiline’s Fall Winter collection. But what do you think? What do you like or do not like about this collection? Post your comments below. We would love to hear from you! P.S. This is a very small sample of the new collection. Stay tuned for Part 2 of this blog post which will feature the rest of the collection. This entry was posted in Riding Apparel and tagged equiline. Bookmark the permalink.